Summer is in full swing and we have been coming up with recipes that don’t require a stove!! I mean really…..it is so HOT HOT HOT out there. The grill is going nightly and so are the outdoor activities! Every night we head out after it starts to cool off and spend time swinging, catching lightning bugs and doing a little swimming with the kiddos. I try to have all the prep work done in advance when the hubbie gets home from work so we can get our dinner underway. I just threw this Herb, Garlic and Parmesan Kabob recipe together last week and thought you guys might want to give it a try. The meat was mouth watering and extremely tender and they only took just a bit to get ready and then of course… the hubbie took care of the rest! 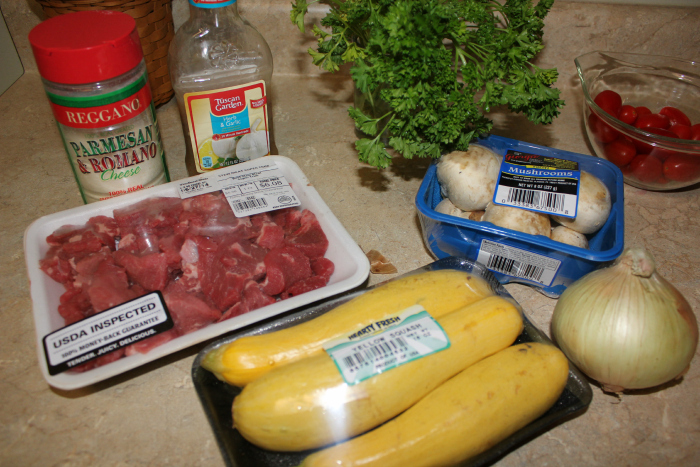 Begin by marinating your stew meat in the Tuscan Garden Herb and Garlic marinade. I put it in the fridge in the morning and let it sit all day but a couple hours would work also if you are pressed for time. I also added a little chopped fresh parsley for added color and flavor. Chop all your fresh veggies that you have on hand into bite size pieces. Assemble on your skewer sticks alternating through everything that you have. Cook for approximately 2-3 minutes each side. Avoid over-flipping them. The time will depend on how hot your grill is and how big your chunks of stew meat are. Enjoy! I hope you all have a great 4th of July!! What do you have on your menu for the 4th?? Yum, this looks great! 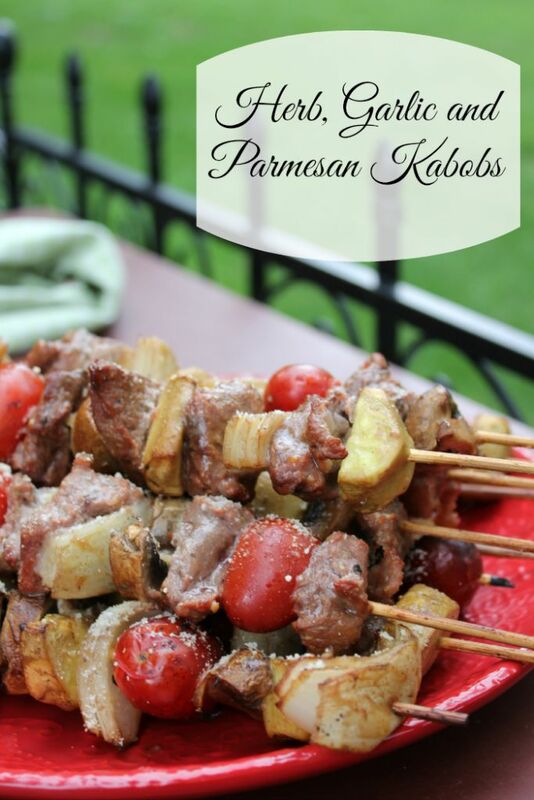 I love kabobs and this flavor combo rocks! I will be featuring you on Redhead’s Kitchen tomorrow! Thank you for linking your awesome grill recipe up on Inspiration Monday Party! I make kabobs often during the summer. They are tasty, versatile and cook up quick. Love your take on it. I found you over at theTwo Cup Tuesdays link party. I host Tickle My Tastebuds Tuesday and would love it if you linked up this recipe. I’m sure our party goers would love it as much as I do. Here is the link http://bit.ly/1jlh94r. Have a wonderful day!! This sounds good. I usually marinade chicken in teriyaki sauce for kabobs. I will have to try this. We don’t have an Aldi, but I will have to figure out something similar. Plus, I love Parmesan. I’m coming over from Wake Up Wednesday. Pinning this. They look absolutely delicious! Again, thanks for coming and linking up at The Weekend Social. All posts get pinned on our pinterest board! Please be sure to come back next week starting Thursdays at 9PM EST on culinaryflavors.gr! I hope to see you there! I’ve been wanting to make kabobs, even just in my oven, broiled since I don’t have a grill. Pinning this. Thanks.